Special LOUNGE SEATING in LOWER TERRACE - we have special lounge seating in the lower Terrace. There will also be several round tables with seating for those who wish to eat or drink while they relax and watch the music. These are first-come, first-served, for all VIP Ticket holders only. Special seating on the upper Mission VIP PAVILION - this is a section made possible by the generous contribution of one of our partners, the Mission de Tolosa, San Luis Obispo. Father Russ "gets the vision" of jazz festival, and truly embraced the spirit of what we are working so hard to accomplish. 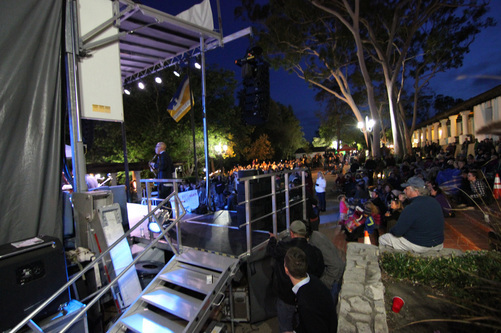 As such, they are making this area available to the SLO Jazz Festival immediately above the steps - by the statue of Father Junipero Serra. This section will be the PREMIERE VIP SECTION this year, and will offer special food service for a brief period. We'll have a VIP Bar in this section, and more! This section holds about 100-120 seats and will be first-come, first-served VIP Ticket Holders only. Quality Reserve Wine Bottle Service - this year, in the Upper VIP Pavilion, we'll be offering the quality reserve wine in a Bottle Service in the (most likely in the Upper VIP Pavilion ONLY). We continue our fine relationship with Central Coast Party Helpers to provide professional service for your beverage needs at the 4th Annual 2017 SLO Jazz Festival. We will be offering food earlier in the day from featured catering companies (note: any special food we provide in VIP will be cut off by about 3:30PM - 4:00PM, so you are encouraged to visit food booths after this time to help support those vendors who are making the effort to provide the highest quality food at the jazz festival possible). ​Please Note: Ins and Outs will be allowed only through 6PM this year and security will follow this strictly to help support our awesome food choices in 2017. What that means is no re-entry after 6PM if you should choose to leave the Festival grounds after that time. If you need an exception, please contact our office prior to the festival.